Last week we took a broad look at how the Big East teams fared when it came to TV ratings for national TV games and came to the conclusion that FOX Sports 1 way overpaid for the content they were receiving. That seemed to draw the ire of fans around the conference who felt we were putting down the Big East. We’ve already published a few analyses of past KenPom ratings that show the Big East will still be a major power player. In no way was it a knock on the play on the court, but rather in the board room of FS1. Yes, they were desperate for content and will end up getting a handful of high profile games as well as a weekly product that appeals to college basketball fans. However, they splurged mega money to acquire a nice conference, from a TV ratings point of view, not a luxury one. It’s true TV ratings aren’t the end-all be-all for a cable channel, but try telling executives they don’t matter. So let’s see what the data tells us. The chart above is of all 12 national TV games played between Big East teams last season. That in itself should be worrisome. Of the 28 overall conference games played between Big East teams, only 10 merited national TV status (Butler’s games against Xavier and Marquette not included as they weren’t in the conference). That means ESPN only wanted 35 percent of available matchups of C7 squads last season. Breaking it down a bit further, it was surprising to see St. John’s and Villanova grab the most slots, each getting five games while Marquette and Georgetown only nabbed four. Not surprisingly, the Golden Eagles or Hoyas were involved in the top-six C7 games and will most likely be the main focus of prime time games for FOX next season. St. John’s once again highlights why they are such a tempting team for national media to cover. They were both at the top and bottom of the TV rankings, meaning people will tune in to wacth in large numbers if they are good of if their opponent is good. The Bottom three teams were DePaul, Seton Hall and Providence who will weigh the conference down heavily from a ratings perspective. Fortunately, Butler, Creighton and Xavier do count come next season and will add a number of quality games to the schedule. Doing a little math, these games averaged 450,250 viewers per game. That’s a solid number that compares decently with the per game average of 501,386 against only the former Big East teams (Louisville, Syracuse, Notre Dame, Connecticut, Cincinnati, Pitt, Rutgers and South Florida). There’s bad news though. Not having ESPN pick up some clunkers like DePaul vs. Providence or Seton Hall raises the average. Nine of the 19 lowest rated games came against USF or Rutgers, yet they still were more appealing than one of the bottom three C7 teams. Luckily, they won’t be in the conference to drag numbers down any longer. Sadly, DePaul and co. will. On average, 800,000 more people watched a game when two teams were ranked than when only one was, using Big East data only. If anyone has the time to do this with all the conferences, be my guest, but this is a large enough sample where it’s not merely a fluke. Viewers like to see games that matter. 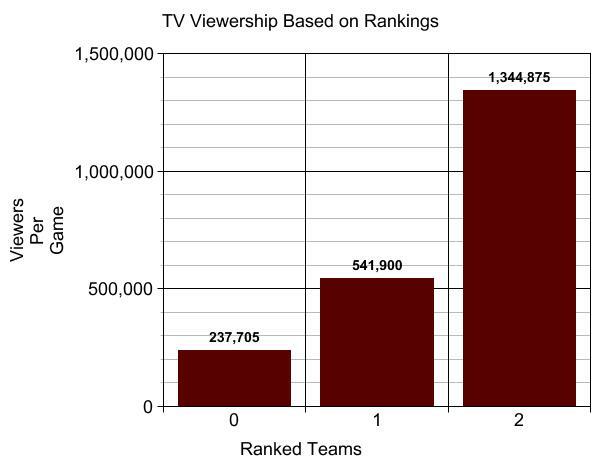 It’s crazy to think on average, twice as many people watched a game when a ranked team was involved than when no ranked teams were involved. So again, for FS1 to get the numbers it wants, the conference will need to have a few teams in the polls each and every week. Not only do the rankings matter, the channel does as well. 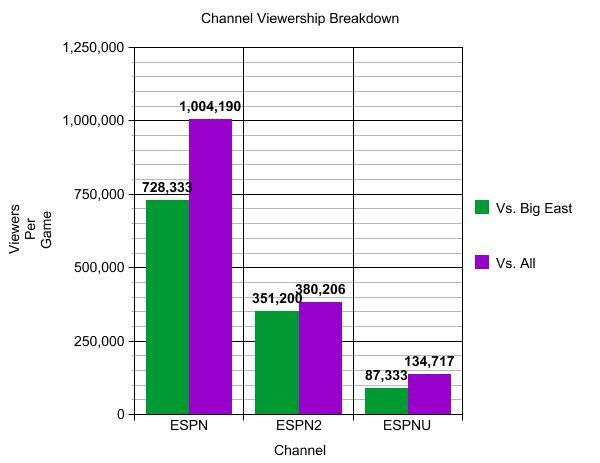 There is a giant gulf between TV ratings when a game is on ESPN than when it’s on a sister channel. (NBC Sports was not included as no C7 games were shown there but the numbers aren’t pretty. Big East teams were featured four times to an average 0.05 rating and 80,750 viewers per game. CBS also wasn’t included as it is not a cable channel and some of their games were regional, not national.). This highlights the difficulty FOX Sports 1 will have in garnering initial interest. Being featured on ESPN meant you were the prime matchup. It symbolized this was a game you should watch. People won’t naturally equate games on FS1 as prime material. Heck, it will take people time to find the channel number. As such, I’m not saying the ratings should initially be compared to those on ESPN. A comparison to those on the deuce will be much more generous. Yet, FOX is marketing itself as an alternative to the worldwide leader, not a little sister. Eventually, it wants to be able to sniff those ESPN ratings. I just don’t see the Big East doing that for them. It is a perfect conference for the teams involved, but being smaller private schools makes it harder to get those ratings numbers as there is no giant pool of natural fans. FOX knew this all beforehand, it’s not news to them, but keep this in mind when the TV ratings start rolling in this fall. It’s hard to believe Fox paid what they did for Big East rights to begin with. Considering the c7 schools added a few mid majors that were all significantly better than the c7 schools themselves you would think the league would draw decent ratings. The schools that stayed in the American and joined were the bread and butter of the old Big East and naturally will continue to be successful programs. I think the c7 schools have really hurt themselves in the mean time by playing in front of no one on television. Yes they got a tv deal paying them 2 or 3 times what they were worth but at what cost? Will these schools do well come tournament time? I think that is the major question to be answered, if they don’t have success when on National broadcasts the league could soon find itself worse off than the A10. Only time will tell if the new Big East remains a respectable league, they can’t blame the football schools any longer, which always seemed stupid to me considering the football schools were the teams playing for National titles.